We are very lucky that, today, pets are living longer and happier lives than ever, thanks to the strength of their bond with their caretakers, the dedication of their families, and to advances in veterinary medicine. As our pets age, though, they do face new challenges. Older animals may have special nutritional needs. Arthritis and other chronic health conditions can lead to pain and mobility problems. They may face behavior changes, digestive trouble, or other chronic illnesses. All of these things can be challenging for both the pet and the people who love them. Pain, in particular, is one of the most important factors in determining a pet’s quality of life. Because dogs and cats do not express pain the same way humans do, it can be challenging to recognize the symptoms of pain in the animals we love. Often, signs of pain are dismissed as normal aging, behavior problems, fatigue, or stiffness. 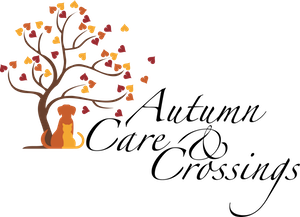 Proper veterinary care is critical for older pets, and geriatric care and pain management are two of the cornerstones of Autumn Care & Crossing’s services. Luckily, there are many different techniques and treatments we can use to address pain and improve your pet’s quality of life. These may include different types of medication and supplements, environmental changes, nutritional support, laser treatment, and other forms of therapy. Dr. Schoenberg will review your pet’s history and previous medical records and discuss your concerns, evaluate their home environment, and then gently examine them. Afterwards, she will work with you to determine a personalized treatment plan to take care of your and your pet’s needs and see to your pet’s health, comfort, and physical and emotional well-being.